Think of Georgia O'Keeffe. What comes to mind are her iconic paintings from her life in New Mexico - arid landscapes, adobe house, animal skulls bleached by the intense sunlight, close focus paintings of flowers. Now, think of Hawai'i. 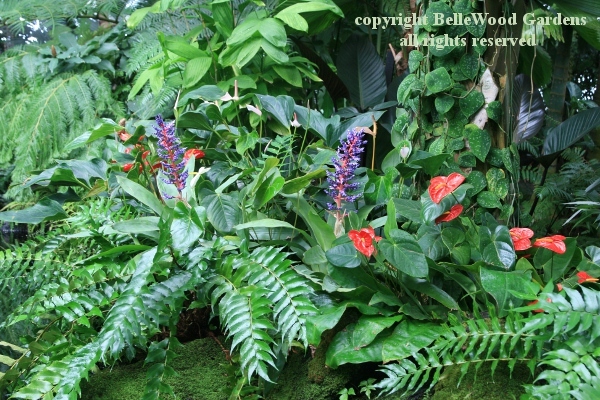 and also lush green tropical landscapes, volcanic lava outcrops meeting ocean waves, exotic tropical flowers. This too was O'Keeffe's world. In 1939 she went to Hawai'i for 9 weeks, funded by the Dole Pineapple Company. In return, she would provide them with two paintings to be used in advertisements. Naturally, as an artist she created many more than just two paintings. Now, almost 80 years later, the New York Botanical Garden has created a multi-disciplinary, multi-site exhibition for Georgia O'Keeffe: Visions of Hawai'i. Come with me for this preliminary viewing, prior to the public opening on May 19, 2018. 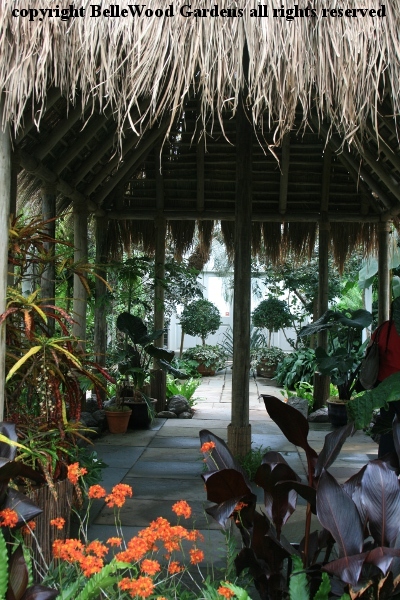 The exhibition begins, of course, in the Enid Haupt Conservatory. 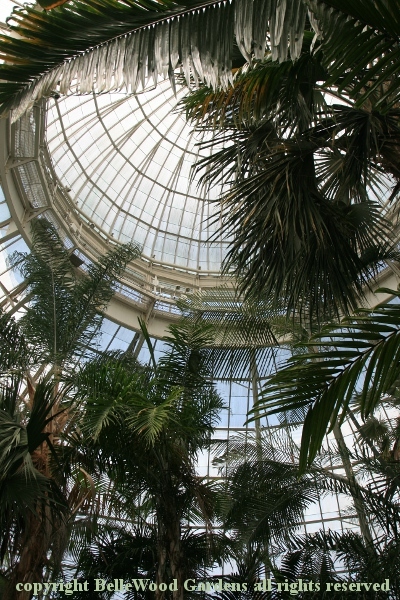 We enter into the 90-foot tall dome arching above the Palm Court. Lush tropical plants fill and overflow pots in the central pool. It is wonderful how the New York Botanical Garden not only creates gardens of beauty, pleasure and delight, but also explains and teaches us about these plants. There are three "waves" of plants growing in Hawai'i. First are the indigenous plants that originated there. Many are endemic, unique to this island location. Many are also at risk of extinction, threatened by introduced plants that have become invasive, and the commercial mono-cropping of sugar cane and pineapples. 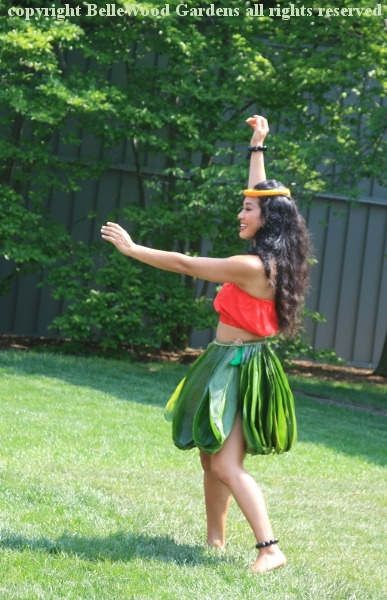 Next are the plants introduced by Polynesian settlers who arrived by canoe many hundreds of years ago, bringing with them the plants they found necessary for food, medicine, cultural practices, and crafts. 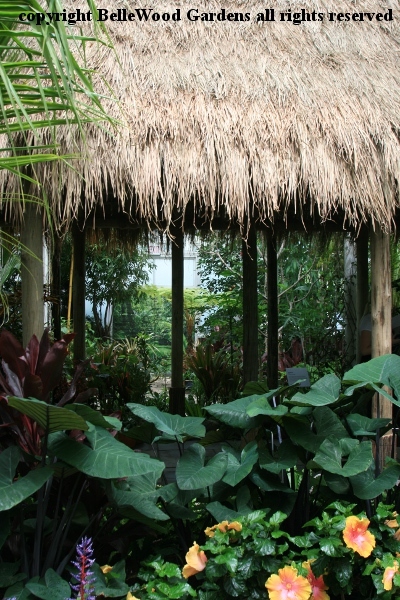 These are referred to as "canoe plants" and include kalo = taro (which, by the way, is called elephant ear and grown as a summer ornamental in New York, New Jersey, Connecticut gardens), mai'a= banana, niu = coconut, ulu = breadfruit.The settlers also acquired 'uala = sweet potato, which confusingly originates in South America. One Polynesian word for sweet potato kuumala resembles kumara, or cumal, the words for the vegetable in Quechua, a language spoken by Andean natives. Did Polynesians voyage to South America? anchors the exuberant, colorful display in the exhibition gallery. 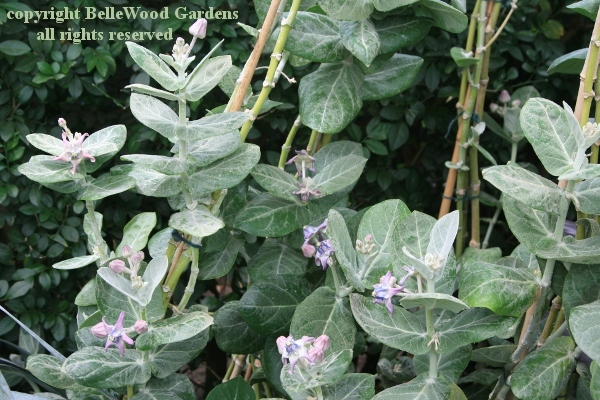 Canoe plants like kalo are being grown in the beds around the hale. 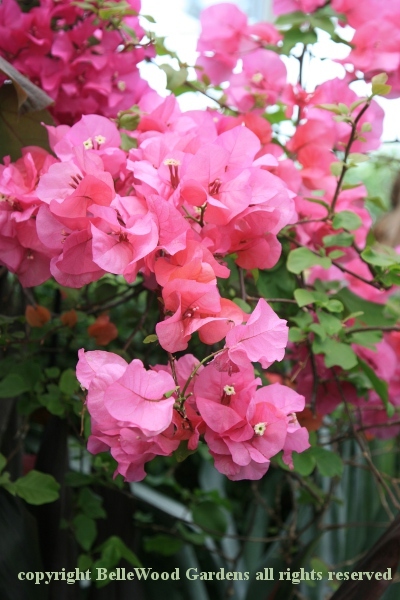 Lastly were plants introduced beginning in the 18th century by European colonists. 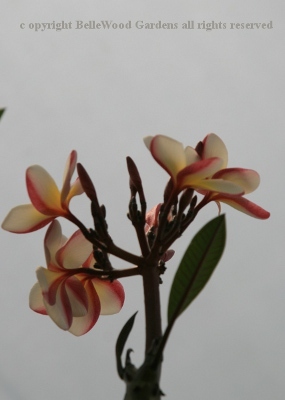 Plants we often think of as essentially Hawaiian such as plumeria, used to make into leis, actually came from Mexico. 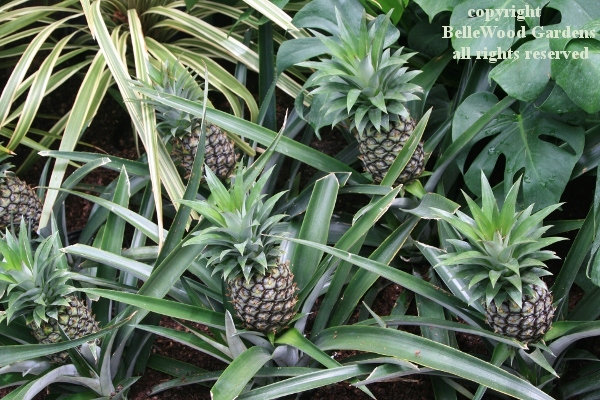 And - are you ready for this - pineapples were brought from Brazil by a Spanish ship. Some of the people here for the press preview dressed simpatico. 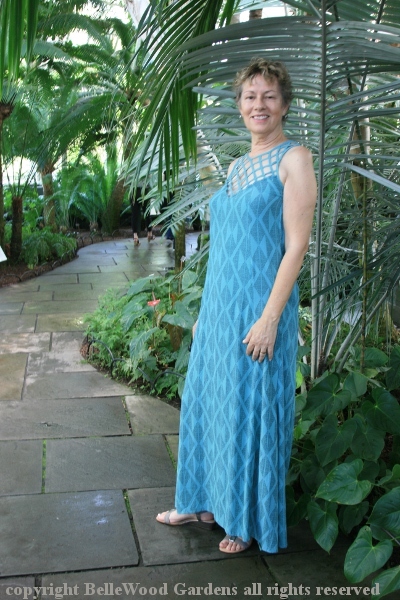 Makana's beautiful dress (designed by Manaola, who pairs traditional Hawaiian design techniques into a modern Hawaiian look) was made with fabric patterned like tapa cloth. And flowers, flowers everywhere all around us. 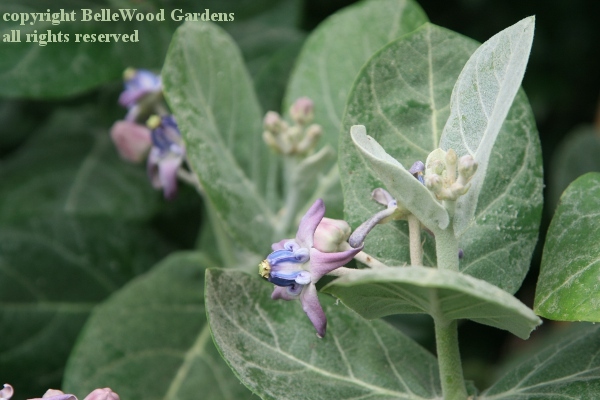 such as this fabulous bowstring hemp, Calotropis gigantea. 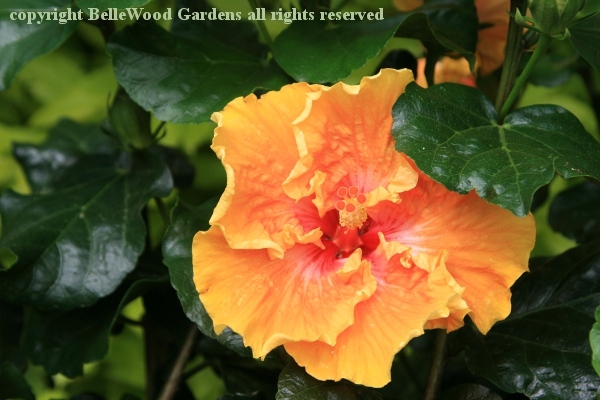 Native to Hindustan, widely naturalized in East and West Indies, and Ceylon, it was favored by the Hawaiian Queen Liliuokalani, who considered them a symbol of royalty and wore them strung into leis. our native asclepiad, orange flowered butterfly weed, Asclepias tuberosa. 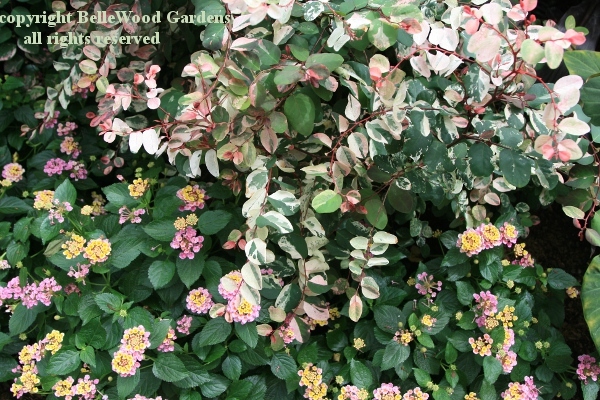 with softly colored flowers of Lantana camara 'Bandana Pink'. String a hammock in the hale and I could easily take a nap. 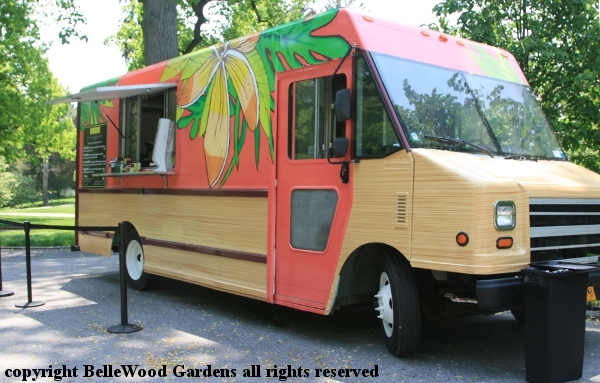 There's a poke truck parked just past the end of the Tulip Tree Allée. a vegetarian topping, avocado, little tomatoes. Will have to check it out. But right now our press group is going to the LuEsther T. Mertz Library Art gallery, for a unique look at 15 of O'Keeffe's Hawaiian paintings, not seen together since their 1940 debut at An American Place gallery in New York City. Open from May 19 through October 28, 2018, you can read more details about the Georgia O'Keeffe: Visions of Hawai'i exhibition here.